All spectators attending the 2016 Yu-Gi-Oh! TRADING CARD GAME World Championship here in Orlando, Florida will receive a drawstring filled with exclusive items, while supplies last. 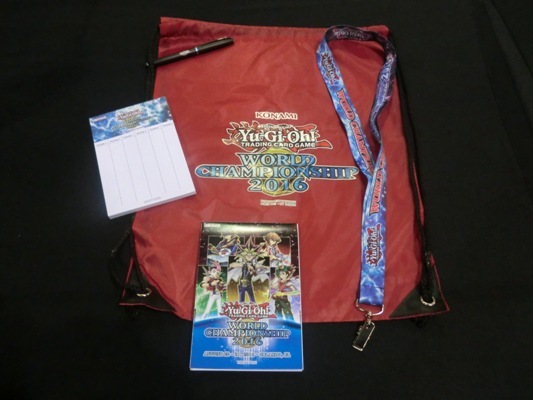 Each drawstring bag includes a World Championship-branded score pad for keeping track of Life Points, a World Championship lanyard, a Yu-Gi-Oh!-branded pen/stylus, and a collectible 2016 World Championship event booklet. Exclusive 2016 World Championship Sleeves! Exclusive 2016 World Championship Win-A-Mat!